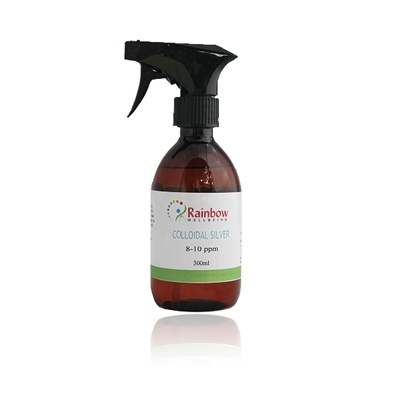 A completely natural solution for infections of any kind, Colloidal Silver is a gentle, yet effective natural antibiotic, completely free of side effects, it does not harm the healthy bacteria in your gut. Effective against around 650 different organisms - compared to the 6 of a pharmaceutical antibiotic. It is safe for adults, children and pets and can be used during pregnancy, Colloidal Silver can be used both topically and internally. Ongoing research may eventually restore Colloidal Silver to its once accepted status as probably the most versatile and effective natural agent against bacteria. It has a hugely important bonus in that bacteria find it almost impossible to develop resistance to it. We supply a pure, high quality, true colloid with silver particles in the correct range of 10-12 parts per million, this ensures a safe and effective product that gives the best results. Produced by advanced electronic equipment using a high voltage AC current giving a very small particle size of 0.01-0.001. The result is a clear to very pale amber liquid for optimum absorption and an indefinite shelf life. This should not be confused with Colloidal Silver produced using a DC current which can form toxic silver salts. Best used as advised by your health care practitioner.